I didn’t even know I would race Kermiscross until 10:34 the night before. That’s when the e-mail came through confirming my first professional start contract in Belgium. No registration fee. No begging for comp’d entry. For the first time in my life, someone would pay me to come to a race. 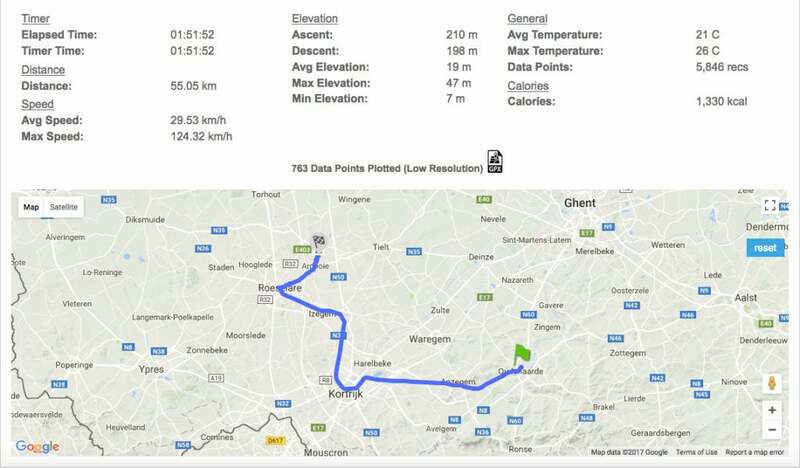 The only hiccup: I had no transportation lined up from my home in Oudenaarde to the race in Ardooie. East Flanders, sleepy region that it is, was not the easiest place to organize last-minute logistics so late at night. But such minor details would not deter me. A good friend said, “You can’t win if you don’t finish. You can’t finish if you don’t start. 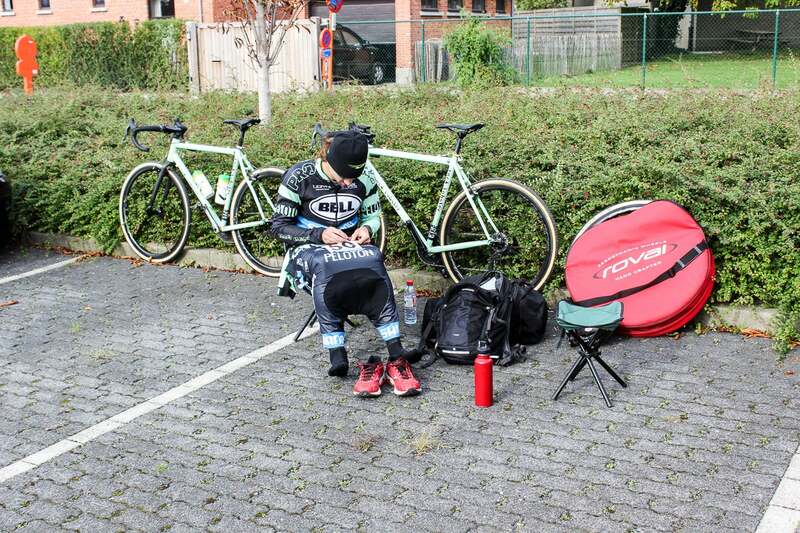 You can’t start if you don’t even show up.” A world-class cyclocross race would happen a mere 36 kilometers from my house. I had my first professional payday of 100 Euros waiting at Sporthal de Ark in Ardooie. I’d be damned if I didn’t get to that start line. We were in Belgium after all and there was more than one way to get there. 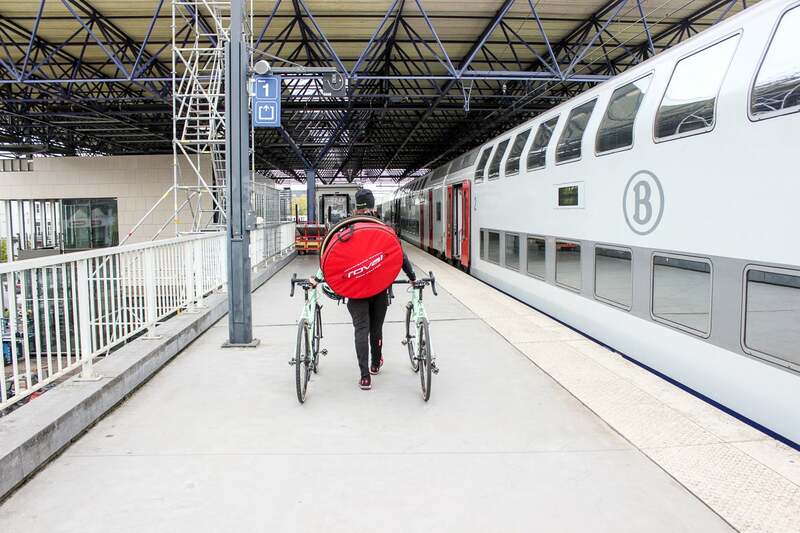 At 9:45 the next morning, my partner, Annick, and I rolled out of our driveway on my two race bikes, bound for the Oudenaarde train station. 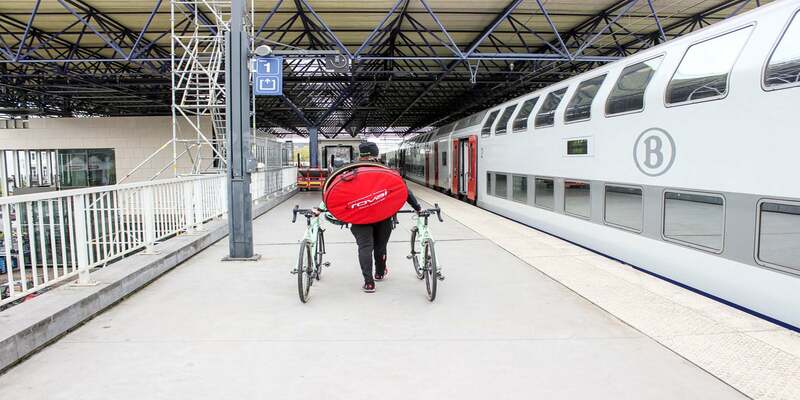 I pedaled the race rig–Annick rode the spare. I prayed we wouldn’t hit any road shrapnel while rolling along on the tubulars. Just in case, two spare wheels hung from my back. We didn’t have the comforts of a pampered professional, but we had everything we needed for an hour of racing. The train to Roeselare passed through the Flemish countryside with half-harvested cornfields and tidy brick houses. From there, an eight-kilometer pedal along the maroon Belgian bike paths gave way to the winding streets of Ardooie. It had cost us 50 euros to get two bikes and two bodies there, but we’d made it to Kermiscross with three hours to spare. 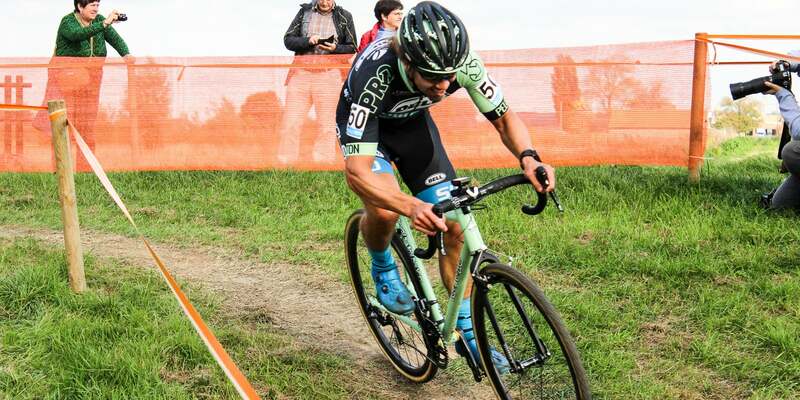 Despite its mid-week time slot, Kermiscross still drew the likes of reigning US National Champion, Compton, World Champion Wout van Aert, and European Champion Toon Aerts. 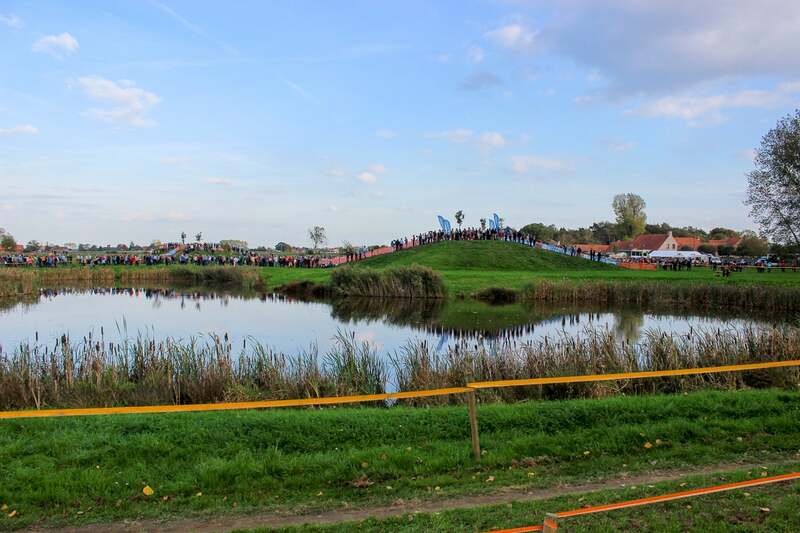 The track was a quintessential Belgian field race (The Flemish term for cyclocross is veldrijden, which literally translates to “field ride”). Portions of the course passed through the town, twisting through the crowds and cutting through alleyways that spit into the cow pastures. In wet years, the race has produced iconic photos of knee-deep muck and long slogging mud pits. However, an unusually dry autumn left the fields firm and fast. No tractor pulls and long runs this year– it would be a drag race through the grassy fields. When the whistle blew, 46 men’s racers exploded off the line, sprinting through town, past the throngs of screaming fans. Brakes screeched as they peloton skidded left across the first cobbled corner before accelerating through the alleyway and into the pastures. The pace didn’t relent for the next hour. The strong men at the front rode away, as smaller groups formed behind. I latched onto some wheels to avoid the solo slog into the headwinds, and it took every bit of strength and determination to stay in contact. The laps ticked down and with three to go, I thought, maybe, just maybe, I would make the lead lap in my second ever Belgian ‘cross race. Despite an average heart rate of 196, I felt amazing finally crossing the line in 33rd. There had been no van to cruise to the start. There had been no trainer for warm up. I had hauled 30 pounds of gear on my back, by bike and train, to the start line. By all counts, I had prepped about as poorly as possible for this bike race. Yet, finishing on the lead lap in Belgium had been a career highlight. Good rides aren’t always a product of neurotic routine–sometimes, you just have to show up. Annick and I rolled back to Roeselare and stopped by the Frituur across from the station. We overpaid (24 Euros) for some frites, chicken sandwiches and cokes, but we didn’t care. We sat cross-legged on the platform waiting for the train home to Oudenaarde. Our red wheel bag might as well have been a white tablecloth, as we laid out our feast. It might not have been the ideal recovery meal. It might have been expensive, but we were happy. We were 26 Euros in the black as we celebrated the first real day of my professional career. We dipped fries in mayonnaise, relishing in the good life of cycling’s Promised Land.